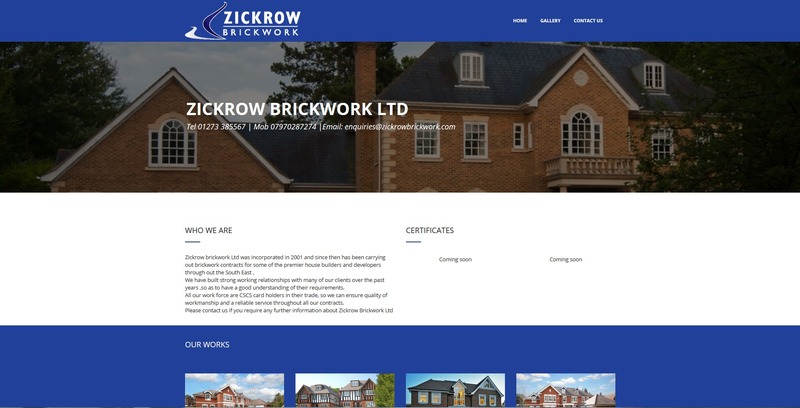 A bricklaying company called Zickrow got in touch to find out more information on our brickwork website design services and costs. We supplied our client with details about our general WordPress pricing and on-going website costs. However, we requested that he filled out our website questionnaire to provide us with more information on the type of site he required, and this was so we could give him a more accurate fixed price quotation. This is because our prices are only guides as not one website is the same. A new logo to be made. 3 pages designed which were – Homepage, gallery and contact us page. 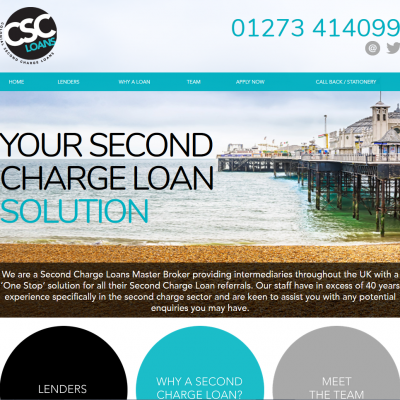 Simple and clean design throughout the site. 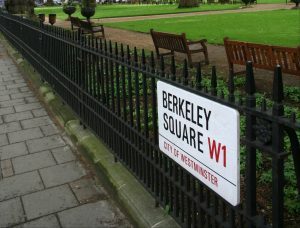 WordPress was the choice of platform to use and this was because he wanted to be able to edit and upload new images to the gallery page himself once his bricklaying jobs were finished. 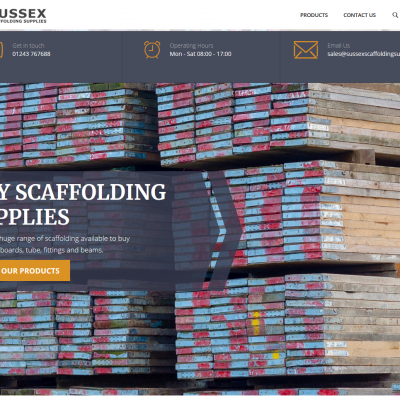 We installed WordPress and uploaded a theme called Cortana, which we had chosen on behalf of this Brighton based bricklaying company. Our logo designers created 3 samples for the client to view and they chose the one that they preferred with a few tweaks to it. We finalised the design and created the logo in various formats suitable for web and print. We added their company logo to the site. Our bricklaying web designers used navy and white colour contrast to compliment the logo. We then uploaded text about the company and the bricklaying services they offer to the homepage. We created a section for the companies’ certificates and accreditations. The client wanted these to be in a prominent position, so his visitors can see Zickrow brickwork is fully qualified and accredited. We added a top banner image of a new house build with layered text over the top which included the clients contact details, so these are easily obtainable by his visitors. Our build team then went on to create a small section of recent works with thumbnail sized images of this brickwork companies newly completed projects. A simple contact form was added to this page. Another section that was important to our client was a small area at the bottom of the site with the logos of the construction companies they work with. Our web builders then added the gallery page and uploaded all of the images our client had supplied for his brickwork projects. These were added in neat rows of three and each image was clickable, so they will enlarge the images to full size and so the viewer could then press the arrow button to scroll through the whole gallery of works. The contact us page was simple with a contact enquiry form, Zickrow brickworks contact information including a mobile number and the office telephone number plus email and office address. We also embedded a Google location map of the office. Desktop site speed which was fine. The site layout, it looked perfect on all mobile devices. The websites loading times and speed on mobiles which were also fine. We installed an SEO plugin so that at a later date SEO could be performed either by us or by the client himself. We integrated MailChimp as our client wanted the option of sending newsletters out to his customers. We also added tracking codes for Google analytics and Bing. Zickrow brickwork is a small but expanding bricklaying company in Brighton. They pride themselves in building beautiful homes and tend to work with the more high-end premier house builders in the south or private clientele who require brickwork, or a new house built. Each brickwork project is undertaken by highly skilled and fully qualified staff and Mr Zickrow is one of them. The company is certified and has many building related accreditations. 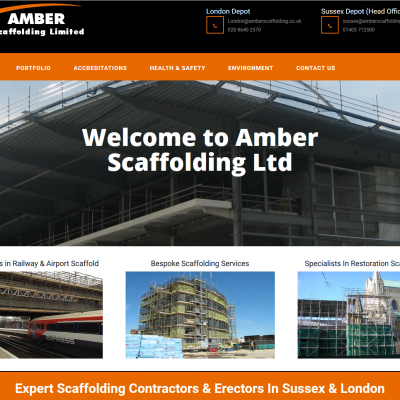 If you like the look of this brickwork website design and have a company that is in the building trade or construction industry, then please contact us to see what our web designers can do for your business.